Whew, what a busy week and we made it through without any illness from Amber! We are also only 7 school days from Christmas break, yay! This week we began our Nutcracker study and it has been a huge hit with Amber. We start each morning with the regular subjects that we are doing for the day, and then finish up the morning and afternoon with the Nutcracker. Yearly Advent calendar, and our Advent "wreath". We love burning the candles during religion class. Amber has loved her coloring time while we listen to the music and during the read aloud of the translated original version of the Nutcracker and the Mouse King. Honestly, I didn't expect it to be her favorite time of the day, but it is. She has even requested to color at other free times, and she is actually coloring the pictures. Amber was never a child who loved to color. She liked it, as long as she could scribble and not really finish any picture. Even as recent as third grade her coloring was just scribbles. She could color properly when strongly encouraged, but preferred to scribble. I'm shocked and pleased at the change. Amber has enjoyed reading different versions of the Nutcracker and looking at all the artwork during the study. The results of the writing assignments to compare and contrast the various versions have been a surprise for me too. Amber seemed resistant to writing as I described her assignment, but returned well constructed and coherent mini-essays within a reasonable time. The Nutcracker writing assignments had far better results than anything we have done through her language curriculum. I only gave her minimal instructions before sending her off to work, desperately hoping she could follow through. Apparently, she does know how to compare items and place things in the proper paragraph, as well as pick out the important details to use. From some more recent writing assignments, you might wonder. Perhaps her regular curriculum has too detailed of instructions. This week was also dress rehearsal during dance classes for Amber's dance recital next Friday. I think everything fits correctly and we have all the proper accessories. I was a bad mom and failed to take any pictures, but I did video Amber's solo dance. She wasn't sure that she wants me to post it though. She was fine tuning parts and it isn't a real performance. Not to mention she was exhausted, hot, and the practice room wasn't big enough so she had to pull up one grand jete or smack the wall. LOL, well it was funny at the time. We have video of a lyrical duet practice too, but it wasn't dress rehearsal. Again, I was a remiss dance mom and failed to video or even watch ballet rehearsal. My mom's birthday. 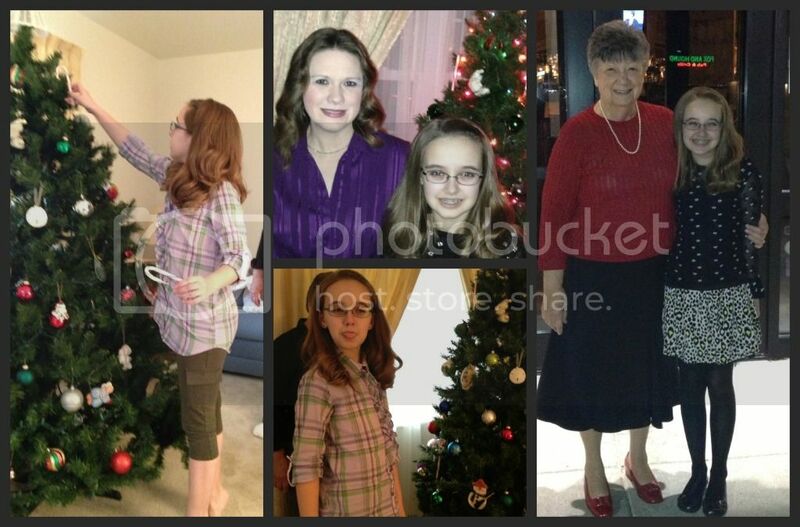 Amber decorated Mom's tree (with some help from Mom) and then we all went to Amber's favorite Italian restaurant for dinner. Yesterday evening, we also had Amber's voice recital. The voice lessons are through a sub-company of her dance studio that offers instruction in various types of arts. This is the first semester for the sub-company and it was a rather small recital (bring your own chair, LOL!). Amber played piano too, as a last minute addition. 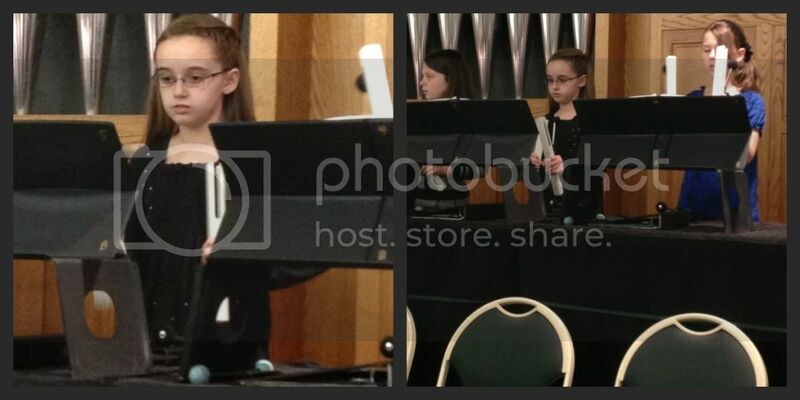 She takes piano lessons from me, but presented her talents in the musical arts to help fill out recital. Some other students performed their solo dances too, but the stage was not large enough for Amber's solo as it was the same practice room from rehearsal. Still, we love the dance studio and all their offerings! Chimes rehearsal. They perform during church from the choir loft, so I can't easily be there during the performance. Tonight, Saturday, the chimes choir had the first of their two performances this semester. They sounded lovely and Amber truly enjoys being in that choir. She is hoping that she gets picked for the next level of handbell choir when she graduates from chimes. Art classes have been going well, and we may be seeing a slight improvement in Amber's abilities. She is having fun trying various mediums, and that's the important part. There is only one art class left of the session and, unfortunately, the tentative dance schedule for next semester places Leaps and Turns during art class. So, looks like she will only be able to take the occasional one day art class. We have done some Christmas present crafts this week too. Amber made sock puppets, from a kit, for her 5 year old cousin and finished the pillow for her baby cousin. She still needs to sew the infinity scarf for her aunt and bake some items for other relatives. 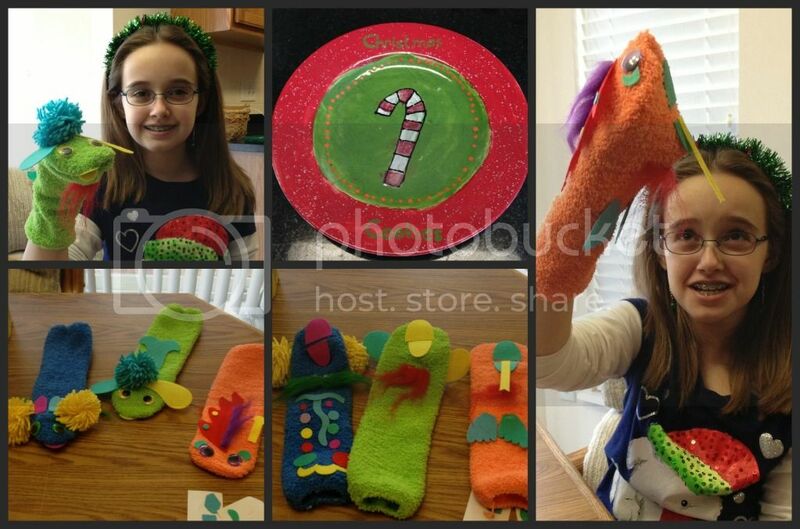 Sock puppets, plus a Christmas Cookie plate designed and painted by Amber. Academically, Amber took and aced another test in Saxon Math. She's sailing along and doing decimal division now. I do believe she will be able to go into pre-algebra next year instead of Saxon 8/7. But we will have to wait to see her scores on the last portion of 7/6 to positively make her placement. This week we will be finishing up math, grammar, Latin, and science for the semester. The last day of the Nutcracker study is Monday and Tuesday we move right into the Christmas Carol study for the next 5-6 school days, but those days will be fairly light since most of the other subjects will have completed. I hope everyone is having a great Advent, enjoying the Christmas season and staying healthy. 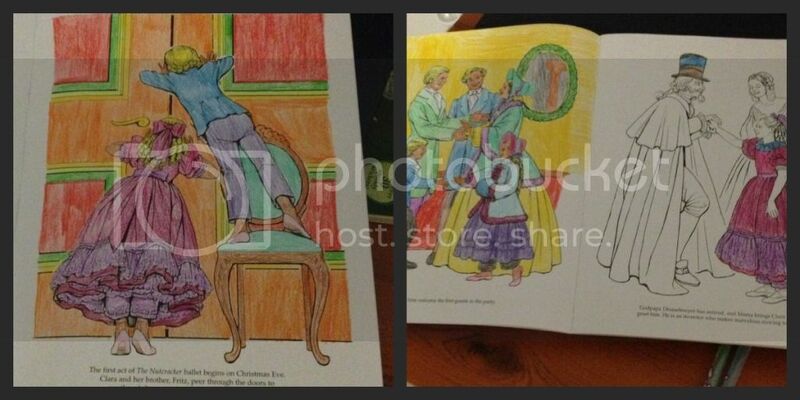 I love that Nutcracker coloring book! I have to look for that! What a great week Christy. You all get so much accomplished! Keilee is sitting on the floor as I type making a stop animation video about The Nutcracker. We did Mary's unit study yesterday. I love the sock puppets. Those are adorable. So glad Amber's recital went well. This is our show week. It is always a crazy week!